Do you have questions about EasyKeeper accounts or how it works? If so, then you’re in the right place. This section is designed to assist you in better understanding EasyKeeper before you start your complimentary trial. Have a question that we don’t have listed? I’s ok to ask. We like to answer. Just use the form below. 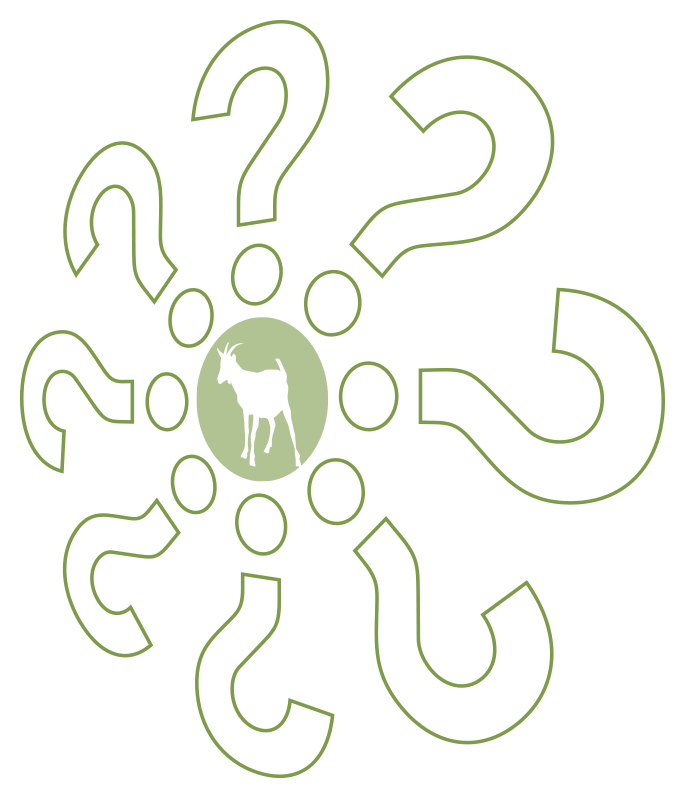 Check out the Knowledge Base accessed from the orange question mark icon at the top right corner of your herd management interface to find answers to questions about your account, subscription and how to use EasyKeeper’s features. Oh, and while you’re there, be sure to browse the Product Suggestion forum and vote for the features that are most important to you! What kind of goats is EasyKeeper made for? EasyKeeper is designed for all types of goats. The Performance plan is ideal for goats used for milk and meat production, cashmere and mohair fiber. The Essentials plan is perfect for goats found on homesteads and hobby farms. Can I use EasyKeeper for animals other than goats? While EasyKeeper is customized for goats, many breeders do find it’s great for other types of animals – and we love that! So, yep, no problem adding your other critters. Just keep in mind if you do add other types of animals there’s currently no way to identify them by species so they’ll be included in your reports… and your steers will be called “wethers”. Is there a charge to try the service? No, nope, zero, zilch, nada. In other words, there is no up-front cost to try out the service. We offer a 30 day trial for you to see if EasyKeeper is the right solution for you. Do I have to provide credit card information to start a trial? We want to make signing up for EasyKeeper as easy as possible for you, and asking you to dig out a credit card would just add an unnecessary step. Therefore, we’ll only ask for your credit card info after you’ve completed your trial and have decided to continue using the service. Is my animal data safe and secure? It sure is. We use industry standard security practices to ensure your data is safe and secure, including using SSL (Secure Sockets Layer) technology for establishing an encrypted link between our web server and your browser. This link ensures that all data passed between the web server and browsers remain private and integral. We also back up your data nightly so we can quickly get you up and running in the very unlikely case of a catastrophic system failure. Is my credit card data safe and secure? Simply put, security of our member’s personal information is our #1 priority. We know our strengths lie in creating terrific goat management software, so we’ve partnered with a third party subscription management service to take care of this important aspect of our service. We chose our provider specifically because they have achieved PCI Level 1 certification in processing, storing, and transmitting credit card information. To be clear, that’s the highest level of certification possible by the Payment Card Industry Data Security Standard. What does my EasyKeeper license provide? The EasyKeeper license associated with your Member Account allows you and your designated agents to manage the data for one farming/ranch operation, even if that operation is spread over multiple locations. If you manage multiple independent operations, you’ll need a separate Member Account and license for each of them. EasyKeeper is a subscription service with an automated recurring billing model. When you create your subscription, you can select the billing interval that’s best for you – monthly or annually – and we’ll take care of the rest. This means you don’t have to worry about remembering to send a monthly payment to keep your account current and access to your data active. When you choose the annual billing option, we’ll kick in one free month each year, prorated across 12 billing periods. My needs might change in the future. Can I change plans later? Absolutely! We know it doesn’t make sense to pay for more than what you need, so we advise starting with the plan that meets your needs today, and switching plans later as your needs evolve. Since EasyKeeper is a web application that runs in your internet browser there is no software to install on your computer. All you need is a computer or mobile device that has a reasonably current version of one of the most popular browsers. We recommend Internet Explorer 10+, Firefox 3+, Safari 5, Chrome 10+, and Opera 10+. Although EasyKeeper will run with a dial-up modem, we do suggest using a a broadband internet connection, such as DSL or high-speed cable modem, or a 3G/4G wireless mobile internet service for the most optimal performance and best user experience. Being able to use EasyKeeper on your mobile devices is an important part of managing your records on-the-go. To help simplify your record keeping, we are currently working on mobile apps for both Android and Apple devices. The mobile apps will support offline data collection and sync’ing to all devices connected to the herd when internet is available. Do you have a question that isn't listed here? Please drop us a line if you have any additional questions at all! We know that adopting a new system can be a big decision, and we’re happy to help you decide if EasyKeeper is right for your operation. Oh, you can find the Knowledge Base here. Your 30 day trial gives you access to all of EasyKeeper’s features. Once your trial is over you can choose the service plan that’s best for you. Your trial is completely risk-free. We won’t ask for your credit card until you are ready. No download required. Access your records online at any time on an internet-connected device. Affordable monthly and annual pricing plans. No commitment, cancel anytime. Have questions? Visit our Q&A page. Select Your Timezone (GMT-10:00) Hawaii (GMT-09:00) Alaska (GMT-08:00) Pacific Time (US & Canada) (GMT-07:00) Arizona (GMT-07:00) Mountain Time (US & Canada) (GMT-06:00) Central Time (US & Canada) (GMT-05:00) Eastern Time (US & Canada) (GMT-05:00) Indiana (East) ------------- (GMT-11:00) American Samoa (GMT-11:00) International Date Line West (GMT-11:00) Midway Island (GMT-08:00) Tijuana (GMT-07:00) Chihuahua (GMT-07:00) Mazatlan (GMT-06:00) Central America (GMT-06:00) Guadalajara (GMT-06:00) Mexico City (GMT-06:00) Monterrey (GMT-06:00) Saskatchewan (GMT-05:00) Bogota (GMT-05:00) Lima (GMT-05:00) Quito (GMT-04:30) Caracas (GMT-04:00) Atlantic Time (Canada) (GMT-04:00) Georgetown (GMT-04:00) La Paz (GMT-04:00) Santiago (GMT-03:30) Newfoundland (GMT-03:00) Brasilia (GMT-03:00) Buenos Aires (GMT-03:00) Greenland (GMT-03:00) Montevideo (GMT-02:00) Mid-Atlantic (GMT-01:00) Azores (GMT-01:00) Cape Verde Is. (GMT+00:00) Casablanca (GMT+00:00) Dublin (GMT+00:00) Edinburgh (GMT+00:00) Lisbon (GMT+00:00) London (GMT+00:00) Monrovia (GMT+00:00) UTC (GMT+01:00) Amsterdam (GMT+01:00) Belgrade (GMT+01:00) Berlin (GMT+01:00) Bern (GMT+01:00) Bratislava (GMT+01:00) Brussels (GMT+01:00) Budapest (GMT+01:00) Copenhagen (GMT+01:00) Ljubljana (GMT+01:00) Madrid (GMT+01:00) Paris (GMT+01:00) Prague (GMT+01:00) Rome (GMT+01:00) Sarajevo (GMT+01:00) Skopje (GMT+01:00) Stockholm (GMT+01:00) Vienna (GMT+01:00) Warsaw (GMT+01:00) West Central Africa (GMT+01:00) Zagreb (GMT+02:00) Athens (GMT+02:00) Bucharest (GMT+02:00) Cairo (GMT+02:00) Harare (GMT+02:00) Helsinki (GMT+02:00) Istanbul (GMT+02:00) Jerusalem (GMT+02:00) Kyiv (GMT+02:00) Pretoria (GMT+02:00) Riga (GMT+02:00) Sofia (GMT+02:00) Tallinn (GMT+02:00) Vilnius (GMT+03:00) Baghdad (GMT+03:00) Kuwait (GMT+03:00) Minsk (GMT+03:00) Moscow (GMT+03:00) Nairobi (GMT+03:00) Riyadh (GMT+03:00) St. Petersburg (GMT+03:00) Volgograd (GMT+03:30) Tehran (GMT+04:00) Abu Dhabi (GMT+04:00) Baku (GMT+04:00) Muscat (GMT+04:00) Tbilisi (GMT+04:00) Yerevan (GMT+04:30) Kabul (GMT+05:00) Ekaterinburg (GMT+05:00) Islamabad (GMT+05:00) Karachi (GMT+05:00) Tashkent (GMT+05:30) Chennai (GMT+05:30) Kolkata (GMT+05:30) Mumbai (GMT+05:30) New Delhi (GMT+05:30) Sri Jayawardenepura (GMT+05:45) Kathmandu (GMT+06:00) Almaty (GMT+06:00) Astana (GMT+06:00) Dhaka (GMT+06:00) Novosibirsk (GMT+06:00) Urumqi (GMT+06:30) Rangoon (GMT+07:00) Bangkok (GMT+07:00) Hanoi (GMT+07:00) Jakarta (GMT+07:00) Krasnoyarsk (GMT+08:00) Beijing (GMT+08:00) Chongqing (GMT+08:00) Hong Kong (GMT+08:00) Irkutsk (GMT+08:00) Kuala Lumpur (GMT+08:00) Perth (GMT+08:00) Singapore (GMT+08:00) Taipei (GMT+08:00) Ulaanbaatar (GMT+09:00) Osaka (GMT+09:00) Sapporo (GMT+09:00) Seoul (GMT+09:00) Tokyo (GMT+09:00) Yakutsk (GMT+09:30) Adelaide (GMT+09:30) Darwin (GMT+10:00) Brisbane (GMT+10:00) Canberra (GMT+10:00) Guam (GMT+10:00) Hobart (GMT+10:00) Magadan (GMT+10:00) Melbourne (GMT+10:00) Port Moresby (GMT+10:00) Sydney (GMT+10:00) Vladivostok (GMT+11:00) New Caledonia (GMT+11:00) Solomon Is. (GMT+12:00) Auckland (GMT+12:00) Fiji (GMT+12:00) Kamchatka (GMT+12:00) Marshall Is. (GMT+12:00) Wellington (GMT+12:45) Chatham Is. (GMT+13:00) Nuku'alofa (GMT+13:00) Samoa (GMT+13:00) Tokelau Is. Once your trial has ended, you will be asked to provide your credit or debit card information to continue using the service. You can cancel your trial anytime during your trial period by going to the My Account link in your EasyKeeper herd management interface.